There has been quite a bit of changes in the world of Azure DevOps at Microsoft, and with some of the announcements last year behind Azure Pipelines, I am digging deeper into the new YAML based build configuration in Azure Pipelines. However, I noticed that there hasn't been much yet written about using the new YAML based markup builds with Classic ASP.NET Framework applications. Thus, I thought it would be useful to share from the bits that I have found so far in working with Azure Pipelines YAML based build configurations. Note that there is already some basic documentation on how to setup a YAML based build in Azure Pipelines using .NET Core here. However, I will show you a simple example for an ASP.NET MVC (.NET Framework 4.7.2) application, configured to build in Azure Pipelines utilizing the new YAML syntax. Next is the Configure step of the wizard, in which you will select a template for your YAML based build configuration file. This step is similar to using the Visual Designer to craft your build pipeline, in the sense that it offers a template to get you started. However, even though the template comes close to providing you with a basic starting point, there is one step that is missing from making it a complete starting point. Nevertheless, I will get to that shortly, for now just continue with the Configure step and select ASP.NET | Build and test ASP.NET projects. On this step, you should now see the Save and run modal side screen pop up next. There are a few important points that you should understand before clicking on the final Save and run button, so let's start from the top. Notice that if you proceed with saving, the wizard will commit the newly minted "azure-pipelines.yml" to the root of your Git repository ( note the './' in front of the file), as this is the default structure expected by Azure Pipelines when configured to utilize YAML based build configurations. Also, the two textboxes are simply the Git entries for commit comments, which will be entered directly into your default branch, that in my case with this very simple example is just 'master'. However, since most developers would be working in a team, I assume you would have a branching strategy that may include multiple branches, one of which will be set as the default branch. This is important because the wizard will always create your initial "azure-pipelines.yml" file in the branch you have have set as the default branch, just something to keep in mind. 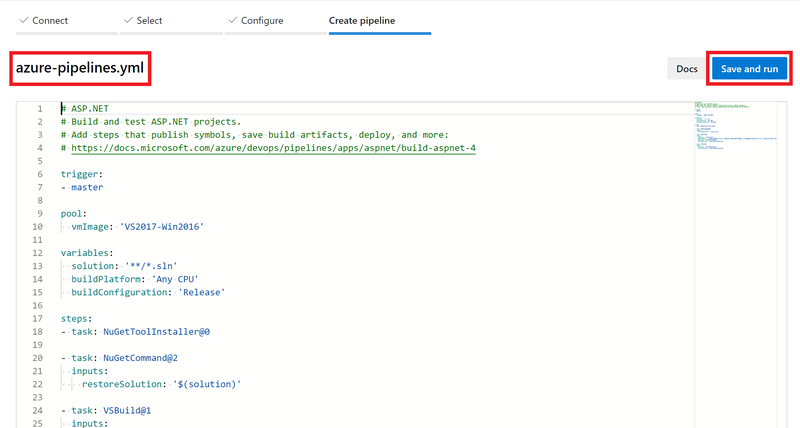 Azure Pipelines feature for supporting YAML based build configurations allows you to version your build pipeline in your own Git repository, while also providing an accessible way to update your builds right from your browser. If you are interested in knowing more about YAML usage in Azure Pipelines, check out the official docs for the YAML schema reference, dive in and have fun.